Let’s begin with the $12 billion in shrink-wrapped $100 bills, Iraqi oil money held in the U.S. The Bush administration began flying it into Baghdad on C-130s soon after U.S. troops entered that city in April 2003. Essentially dumped into the void that had once been the Iraqi state, at least $1.2 to $1.6 billion of it was stolen and ended up years later in a mysterious bunker in Lebanon. And that’s just what happened as the starting gun went off. When the bad press started, Parsons Corporation, the private contractor that built it, agreed to fix it for nothing more than the princely sum already paid. A year later, a New York Times reporter visited and found that “the ceilings are still stained with excrement, parts of the structures are crumbling, and sections of the buildings are unusable because the toilets are filthy and nonfunctioning.” This seems to have been par for the course. Typically enough, the Khan Bani Saad Correctional Facility, a $40 million prison Parsons also contracted to build, was never even finished. And don’t think that this was an aberration. The U.S. Agency for International Development (USAID) hired an American nonprofit, International Relief and Development (IRD), to oversee an ambitious road-building program meant to gain the support of rural villagers. Almost $300 million later, it could point to “less than 100 miles of gravel road completed.” Each mile of road had, by then, cost U.S. taxpayers $2.8 million, instead of the expected $290,000, while a quarter of the road-building funds reportedly went directly to IRD for administrative and staff costs. Needless to say, as the road program failed, USAID hired IRD to oversee other non-transportation projects. So much construction and reconstruction — and so many failures. There was the chicken-processing plant built in Iraq for $2.58 million that, except in a few Potemkin-Village-like moments, never plucked a chicken and sent it to market. There was the sparkling new, 64,000-square-foot, state-of-the-art, $25 million headquarters for the U.S. military in Helmand Province, Afghanistan, that doubled in cost as it was being built and that three generals tried to stop. They were overruled because Congress had already allotted the money for it, so why not spend it, even though it would never be used? And don’t forget the $20 million that went into constructing roads and utilities for the base that was to hold it, or the $8.4 billion that went into Afghan opium-poppy-suppression and anti-drug programs and resulted in… bumper poppy crops and record opium yields, or the aid funds that somehow made their way directly into the hands of the Taliban (reputedly its second-largest funding source after those poppies). All of this just scratches the surface when it comes to the piles of money that were poured into an increasingly privatized version of the American way of war and, in the form ofovercharges and abuses of every sort, often simply disappeared into the pockets of thewarrior corporationsthat entered America’s war zones. In a sense, a surprising amount of the money that the Pentagon and U.S. civilian agencies “invested” in Iraq and Afghanistannever left the United States, since it went directly into the coffers of those companies. Clearly, Washington had gone to war like a drunk on a bender, while the domestic infrastructure began to fray. At $109 billion by 2014, the American reconstruction program in Afghanistan was already, in today’s dollars, larger than the Marshall Plan (which helped put all of devastated Western Europe back on its feet after World War II) and still the country was a shambles. In Iraq, a mere $60 billion was squandered on the failed rebuilding of the country. Keep in mind that none of this takes into account the staggering billionsspent by the Pentagon in both countries to build strings of bases, ranging in size fromAmerican towns (with all the amenities of home) to tiny outposts. There would be 505 of them in Iraq and at least 550 in Afghanistan. Most were, in the end, abandoned, dismantled, or sometimes simply looted. And don’t forget the vast quantities of fuel imported into Afghanistan to run the U.S. military machine in those years, some of which was siphoned off by American soldiers, to the tune of at least $15 million, and sold to local Afghans on the sly. And lest you imagine that the U.S. military has learned its lesson, rest assured that it’s still quite capable of producing nonexistent proxy forces. Take the Pentagon-CIA program to train thousands of carefully vetted “moderate” Syrian rebels, equip them, arm them, and put them in the field to fight the Islamic State. Congress ponied up $500 million for it,$384 million of which was spent before that project was shut down as an abject failure. By then, less than 200 American-backed rebels had been trained and even less put into the field in Syria — and they were almost instantly kidnapped or killed, or they simply handed over their equipment to the al-Qaeda-linked al-Nusra Front. At one point, according to the congressional testimony of the top American commander in the Middle East, only four or five American-produced rebels were left “in the field.” The cost-per-rebel sent into Syria, by the way, is now estimated at approximately $2 million. You’ve just revisited the privatized, twenty-first-century version of the American way of war, which proved to be a smorgasbord of scandal, mismanagement, and corruption as far as the eye could see. In the tradition of Watergate, perhaps the whole system could be dubbed Profli-gate, since American war making across the Greater Middle East has represented perhaps the most profligate and least effective use of funds in the history of modern warfare. In fact, here’s a word not usually associated with the U.S. military: the war system of this era seems to function remarkably like a monumental scam, a swindle, a fraud. The evidence is in: the U.S. military can win battles, but not a war, not even against minimally armed minority insurgencies; it can “stand up” foreign militaries, but only if they are filled with phantom feet and if the forces themselves are as hollow as tombs; it can pour funds into the reconstruction of countries, a process guaranteed to leave them more prostrate than before; it can bomb, missile, and drone-kill significant numbers of terrorists and other enemies, even as their terror outfits and insurgent movements continue to grow stronger under the shadow of American air power. Fourteen years and five failed states later in the Greater Middle East, all of that seems irrefutable. And here’s something else irrefutable: amid the defeats, corruption, and disappointments, there lurks a kind of success. After all, every disaster in which the U.S. military takes part only brings more bounty to the Pentagon. Domestically, every failure results in calls for yet more military interventions around the world. 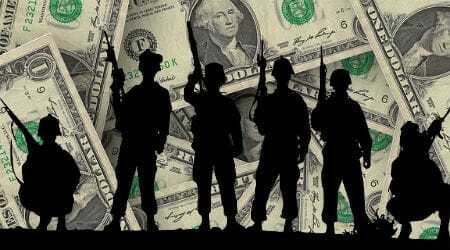 As a result, the military is so much bigger and better funded than it was on September 10, 2001. The commanders who led our forces into such failures have repeatedly been rewarded and much of the top brass, civilian and military, though they should have retired in shame, have taken ever more golden parachutes into the lucrative worlds of defense contractors, lobbyists, and consultancies. Tom Engelhardt, co-founder of the American Empire Project, runs the Nation Institute’s TomDispatch.com. His latest book is, Shadow Government: Surveillance, Secret Wars, and a Global Security State in a Single-Superpower World (with an introduction by Glenn Greenwald). Previous books include Terminator Planet: The First History of Drone Warfare, 2001-2050 (co-authored with Nick Turse), The United States of Fear, The American Way of War: How Bush’s Wars Became Obama’s, The End of Victory Culture: a History of the Cold War and Beyond, as well as of a novel, The Last Days of Publishing. To stay on top of important articles like these, sign up to receive the latest updates from TomDispatch.com here. This entry was posted in PPJC Picks and tagged Afghanistan, Corruption, iraq, Military Spending by PPJC Admin2. Bookmark the permalink.